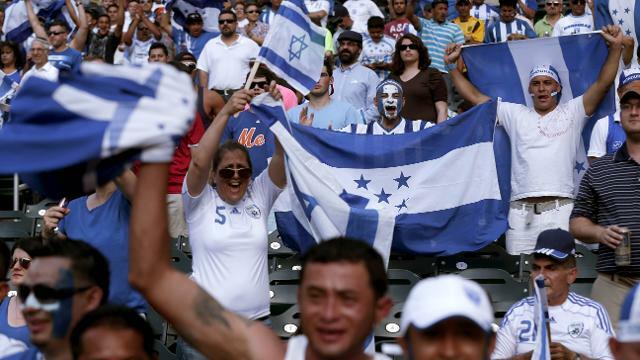 Honduras Football Fans – Page 5 – Following Honduras at the World Cup! Uruguay eliminated Italy from the 2014 World Cup when they both battled each other in the group stages and when the Italian side was knocked out from the worldwide competition, the head coach of the team Cesare Prandelli chose to step down from his role in the team as he dropped out from coaching the squad. This occurred in June 24 which has been already more than 1 month ago and so far it still remains unclear as to which manager will be coaching the Italian national team. The manager of the Honduras national football team, Luis Fernando Suarez, has said that the spirits in his camp have not gone down in spite of two defeats in two matches. According to Suarez, he and his players are still very optimistic about making it to the pre quarter final round. Honduras has created an unthinkable during after managing to qualify for the FIFA World Cup for a second consecutive time. They were surprise entrants to the World Cup 2010 in South Africa. After managing to salvage pride in this competition, they have managed to do the unthinkable by qualifying for the World Cup 2014. They have been put in a group containing the likes of France and Ecuador. Switzerland are the other group opponents, which has given Honduras a real belief that they can reach the knockout stages if they played exceptionally well. Honduras went through the World Cup qualifiers by claiming victories against Mexico and Costa Rica as well as edging draws when they faced off with Jamaica and Panama. All of those results allowed the team of Luis Fernando Suarez on getting a spot into the last 16 remaining teams which will be travelling to Brazil. France, Ecuador and Switzerland are all of the opponents that Honduras was pitted with and will be what stands in the way of Fernando Suarez and his side if they want to enter the next stages of the upcoming World Cup. The English FA have announced that they will play against three teams from South America as part of the preparations for the World Cup 2014. England originally had just one match against Denmark prior to the World Cup, but the England FA have decided to add matches against Peru, Ecuador, and Honduras in order to give the team experience of playing against a South American team and also in the tough conditions expected in Brazil. South American teams are at an advantage when it comes to playing in the hot and humid conditions. Five-time world champions Brazil will be taking on Honduras in a friendly match in November. Honduras are regarded as one of the minnows in world football. Even though they have done well in recent World Cup qualifying matches, they are expected to be no match for the resilience. Brazil’s manager Luiz Felipe Scolari decided to hand debuts to a number of lesser-known players in the hope that they would be enough to win this match. However, the former Chelsea manager has confirmed that Brazil are not taking their opposition lightly. Hull City has to face Newcastle United in an away game on Saturday and two of their main players are not available for selection i.e. Maynor Figueroa and Robert Koren. Koren who is the skipper of the team as well has suffered a leg fracture and has been ruled out for a couple of months, while, Figueroa has gone back to his country Honduras for a few days because of some family problem. Despite the absence of these two players, the manager of Hull City, Steve Bruce, is pretty confident about the chances of his team against Newcastle. The Spanish top flight, La Liga, is one of the most illustrious leagues in the world and the subject of a great deal of speculative sports betting. As is so often the case, Barca are odds on across the board for the title, whereas Real Madrid are a generous 5/4 with most bookmakers. If Real can complete the signing of Gareth bale this could be an excellent bet. The key to winning La Liga is avoiding draws and breaking stubborn lower league teams down. The pace of Bale and Ronaldo would be unplayable at times and could give Real the edge over Barca. New England Revolution striker Jerry Bengtson has not featured for the Honduras national team in recent times after falling out with manager Fernando Suarez after his recent comments. Bengtson criticised the manager for not including him in the starting line-up in a recent match against Jamaica. The player was on the bench for the entire 90 min, which frustrated him. Due to these comments, Bengtson has not played for the national team for more than a month. The manager, though, has said that he does not rule out the prospect of Bengtson returning to the national team. Honduras have been one of the surprise package is in the World Cup qualifying from the Concaf this time around. They are in with a shout of reaching the 2014 FIFA World Cup, which is incredible considering the modest strength of a team. One of the biggest assets from manager Luiz Fernando Suarez is Boniek Garcia, who has been one of the best players for Honduras in their World Cup qualifying group this season. He has been improving in every match ever since moving to play in the MLS with Houston Dynamo.